Join the discussion on our forums! Come discuss Rabble Bouncer over in our dedicated Rabble Bouncer discussion topic. Not bad alongside Leeroy/Cornered Sentries. Never worth running 2-of in Constructed but certainly not bad. One of the anti-aggro cards of the set. I dont think it will see play over Belligerent Gnome. And I don't think Belligerent Gnome will see play over Tar Creeper until rotation, so that says a lot about this card. In the current meta, this is a solid gold star of a card. Something that could potentially be played for free and then buffed to keep your opponents silver hand recruits from overwhelming you. Then again... when you play against anything but a swarm deck, it's a craptastic card in your hand that isn't worth the pixels used to map it. Seems like a hate card that's only really useful against ccertain decks. 2/7 statline on a taunt is only ever useful if your opponent plays lots of small guys (aka really just Odd Paladin. Zoo won't have much of a problem running this over). Against slower decks it will just clog your hand. not to mention it doesn't contest Level Up! so it's not even that good of a tech card. I do however like the possibilities with Star Aligner basically punsihing any deck that goes wide in the lategame...but I don't think we have those atm. Excellent arena card for slow decks. In all honesty, this seems pretty decent if you can get her down to at least 4, and at 2 or lower she'll be outstanding. Plus, as Ridiculous already pointed out, 7 health plays well with Star Aligner. Maybe not the best Ranked option, but you know someone's gonna live the dream in Arena. To stop flood or not to stop it? 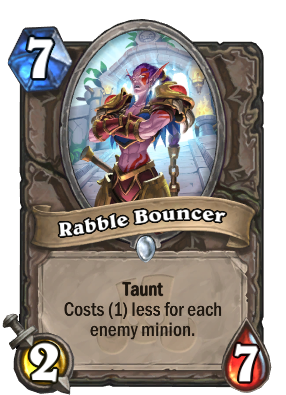 If your opponent has 6 or more minions, you can play double Rabble Bouncer and Star Aligner and then wave goodbye to them.